Forums at Modded Mustangs > Vendors > CARiD.com > Up to $250 Mail-in Rebate with new Corsa Offer! Up to $250 Mail-in Rebate with new Corsa Offer! Welcome the new offer on Mustang Exhausts by Corsa at CARiD! 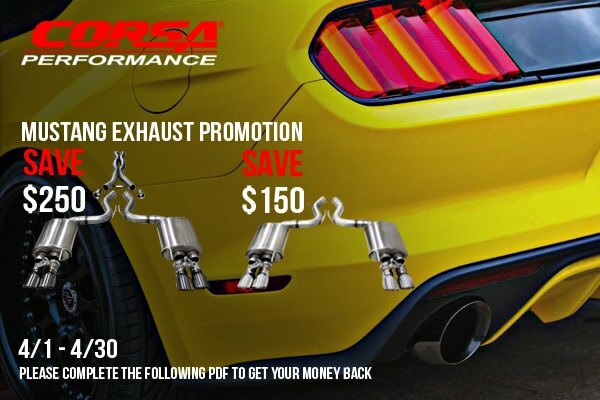 For 1 month only Corsa offers a wonderful deal - receive up to $250 mail-in rebate for qualifying CORSA Performance GT Exhaust. The offer is valid until April 30, 2019. A simple upgrade like the new Corsa exhaust system delivers exceptional performance and track-inspired growl without the interior drone. You would be able to improve your pony's exhaust flow for an increase in overall performance without any hassle. Corsa GT exhaust systems feature 304 stainless steel construction, mandrel-bent tubing, high-flow multi-core mufflers, and a bolt-on, no-weld design. Give your Mustang the true voice of performance with Corsa exhaust system on! Please fill in the following PDF form to get your rebate.